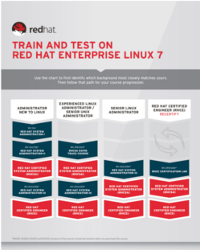 Red Hat Satellite 6 Administration is a lab-based course that explores the concepts and methods necessary for successful large-scale management of Red Hat® Enterprise Linux® systems. Course participants will learn how to install Red Hat Satellite 6 on a server and populate it with software packages. This course is based on Red Hat Enterprise Linux 7 and Red Hat Satellite server 6. It also includes the Red Hat Certified Specialist in Deployment and Systems Management Exam (EX403) based on Red Hat Satellite 6. This course is intended to develop the skills needed to more efficiently design, configure, test, and deploy computer systems within an organization. Doing so will reduce unexpected downtime of systems and facilitate more efficient deployment of new systems, applications and features. As a result of attending this course, students should be able to leverage the software development life-cycle process to plan, create, test, and provision host systems within an organization. Install Red Hat Satellite 6 on a server and populate it with Red Hat Enterprise Linux software content. Effectively control user access for Red Hat Satellite administration. Register hosts to a Red Hat Satellite server, both interactively and automatically. Control which packages hosts can install and which updates are propagated to hosts and evaluate host deviations from corporate standards. Create RPM packages for deployment of programs and files on client systems. Incorporate non-Red Hat software packages into a Red Hat Satellite framework. Create and populate a Puppet repository within a Red Hat Satellite framework. Deploy and provision hosts using PXE. Configure host provisioning for integration with software and configuration management and discover unprovisioned host and provision-discovered hosts.